Here on the Gallery of the Absurd, I usually try to feature advertisements, signs, or labels that I find or one of the Gallery fans sends to me. I try not to put up those items that commonly make the rounds of the Internet or are featured in the mainstream media. Today, however, I'm making an exception. This is something created by the advertising agency, DDB Brazil. 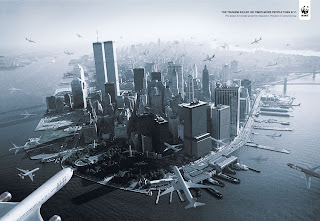 As you can see, it presents a series of planes heading toward Manhattan, complete with the once-standing Twin Towers. The caption on the ad reads, "The tsunami killed 100 times more people than 9/11. The planet is brutally powerful. Respect it. Preserve it." I acknowledge that natural, as well as man-made, disasters around the world have killed many more people than what occurred on 9/11, and I do believe that at times Americans are so insular that they tend to forget or ignore the more devastating tragedies that happen beyond its borders. But isn't conjuring the events of 9/11 a tasteless and insensitive way to make your point? I learned of the DDB ad on Keith Olbermann's Countdown last night, during his "Worsts" segment. Check it out to see his take on this debacle. He even lists the names of the people responsible. Sometimes I ask myself, "Why do I think advertising and marketing folk are so evil?" Then I see an ad like this, and I'm reminded why. This ad would be even better if it played Wagner's 'Ride of the Valkyries' while you looked at it.